Student posters calling MPs- particularly Liberal Democrats- who failed to oppose tuition fee rises “liars” have been removed from train stations in England following criticism from Network Rail bosses. The bosses called the posters “political” and asked them to be removed. The posters in London, Manchester and Sheffield were aimed at around 30 MPs who the NUS says broke their promises. NUS president Toni Pearce said the campaign would continue. The campaign emphasised that in 2010, all 57 elected Liberal Democrat MPs signed the pledge to vote against tuition fee increases. However, 28 Liberal Democrat MPs broke their pledge; and 8 abstained from voting. 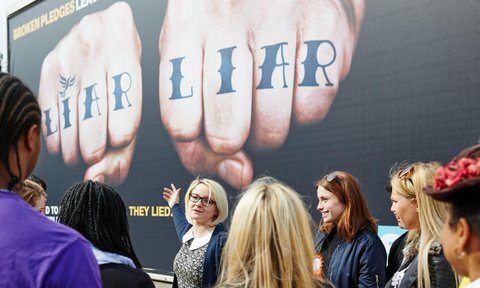 The billboard campaign states ‘Broken promises leave a permanent mark…’ below two fists, each blemished with ‘Liar’, and including the Liberal Democrat logo. A spokeswoman for Network Rail said no political activity of any kind was allowed on railway stations, including campaigning by candidates and political posters. The station posters were put up on 24 April, but were removed after railway bosses intervened. With the government spending £530,000 on a last-minute drive to entice students to put their name on the electoral register, and many students not registered to vote in their halls of residence, the campaign aims to inform students about why they should vote, and to remind them of the coalition’s broken promises. The campaign is aimed at 28 Liberal Democrats, including Nick Clegg, David Laws and Vince Cable. Two Conservative MPs are also accused by the NUS of failing to keep a promise to oppose the increase. The ‘Liar Liar’ campaign has been heavily criticised by students and Liberal Democrat supporters. A campaign titled ‘#trollNUS’ was set up in response of the campaign to encourage students who disagree with it to make donations to the Liberal Democrats. The ‘#trollNUS’ campaign was set up by Joseph Miles, a Politics student at Oxford University who started a Facebook event titled ‘Troll the NUS executive; donate to the Liberal Democrats!’ “as a joke” and it “just took off unexpectedly” from there. Miles told the Oxford Student: “The hashtag was really an afterthought for people to express support…the NUS has a problem with accountability, and its internal structures are almost impossible to understand.